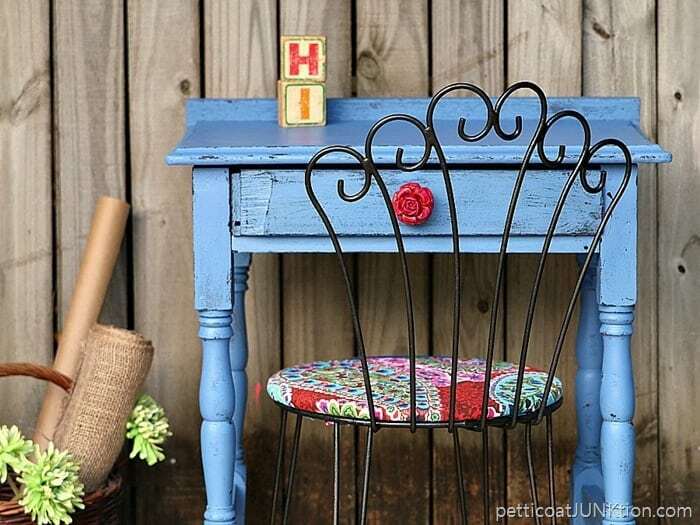 How To Paint Vintage Furniture And What Fabric Was That? 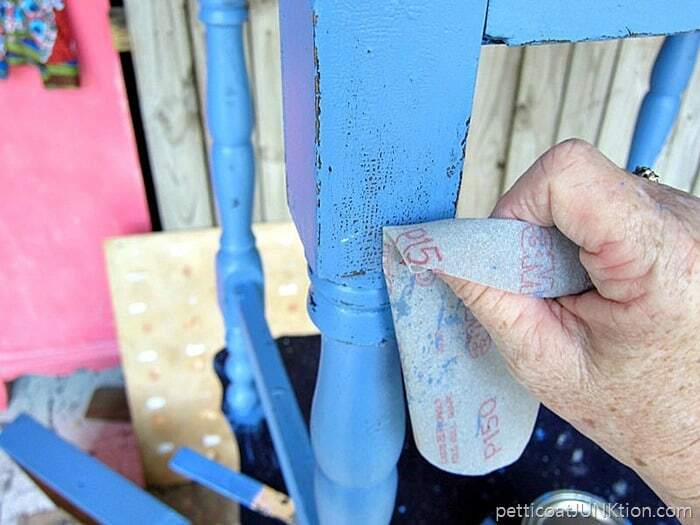 Hey, I’ve got that tutorial for you guys today on how to paint vintage furniture. 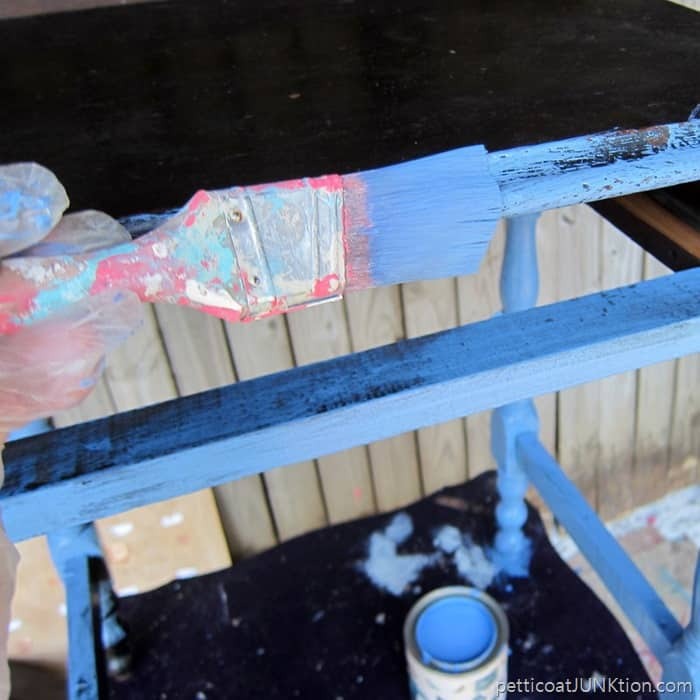 All the details on the beautiful blue desk from last week including where the fabric came from and what paint I used are right here. 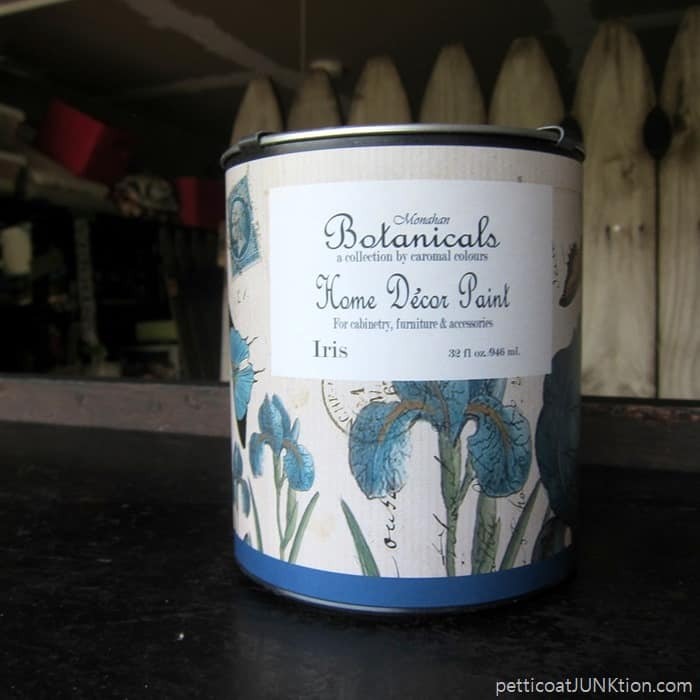 The paint is “ Botanicals “ made by Caromal Colours. I attended a two day workshop back in 2007 in Pennsylvania when Caromal Colours was a very young company. Carol, the creator of Caromal Colours taught the class. I used the Country Living Caromal Colours line of paint for many years. 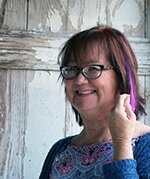 The Botanicals line is fairly new and Sara at the shop where I have a booth retails the paint. She hasn’t had a chance to try the latest formulation of the paint and she asked me to try it out. So I did. I’ll give you my opinion of the paint at the end of the post. I applied a coat of paint to the desk and let it dry overnight. The paint covered really well so I just gave the desk a light coat of paint the next day….mainly to cover areas I missed. 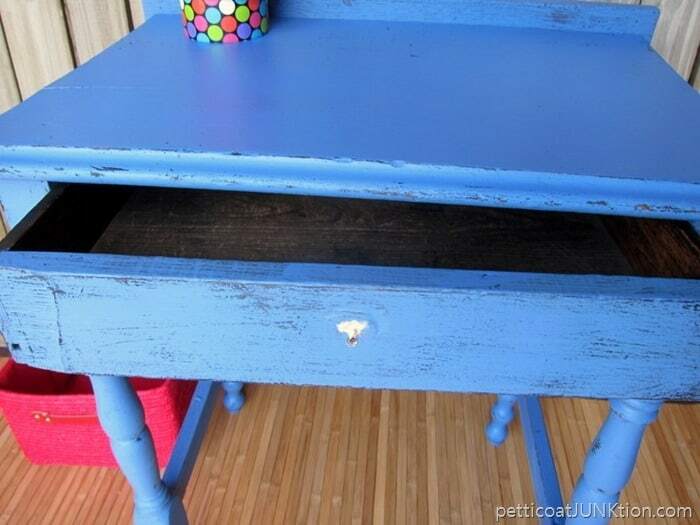 The desk had dings and chipped off wood so of course I distressed the paint. No way was the desk ever going to look perfect anyway. I’m very impatient and I decided to wet sand. At the Haven Blog Conference in August the 3M vendor was handing out samples of their new 3M flexible sandpaper so I gave it a try. I love it. It doesn’t tear and I can bend it or roll it or whatever. Anyway, the second coat of paint was still a little wet to the touch and I just started sanding. The paint came off pretty easily and I was careful not to overdo it. 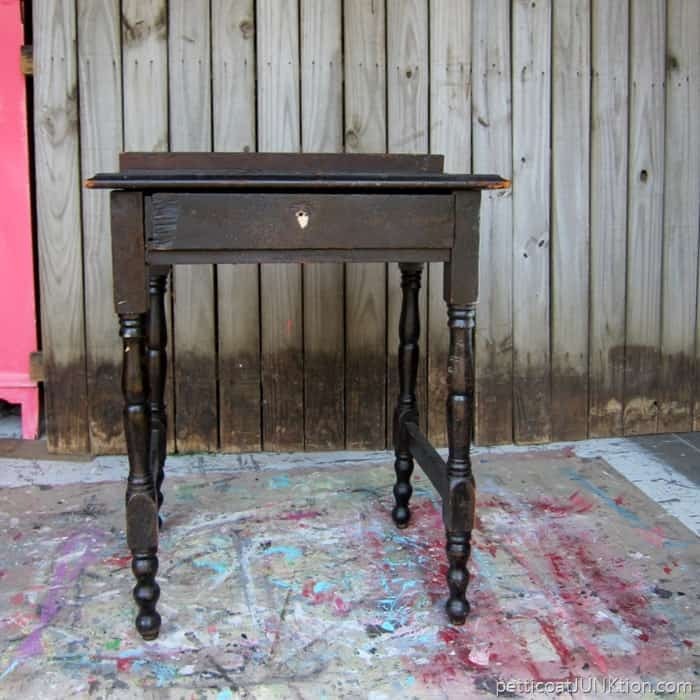 The photo above shows the beautiful crackle of the original finish on the desk. Moving on to the drawer pull/ curtain tieback. I have a bag of seven of these. Someone told me that might be curtain tiebacks? 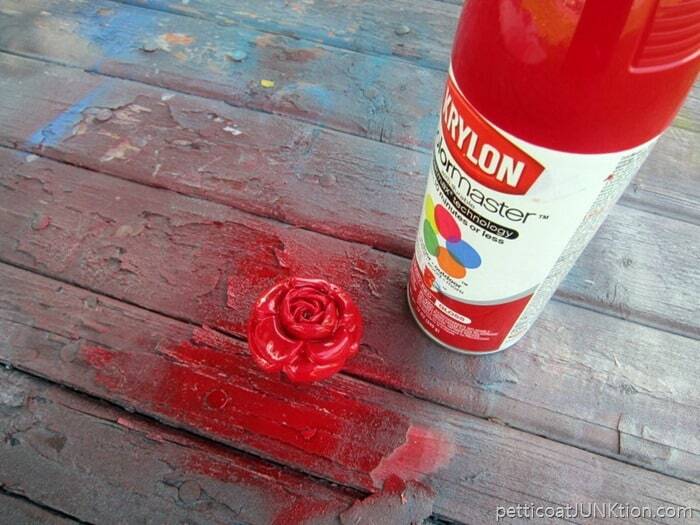 I thought the rose would be perfect for the desk…if I painted it. The pretty paint I decided on is the Krylon Cherry Red Gloss. Once the rose was dry I “dry-brushed” a little fuchsia paint over the petals. Just so it wouldn’t be so flat looking. The red rose had a screw embedded in the back so all I had to do was screw it into the hole on the desk drawer. The only problem is the hole was too big. 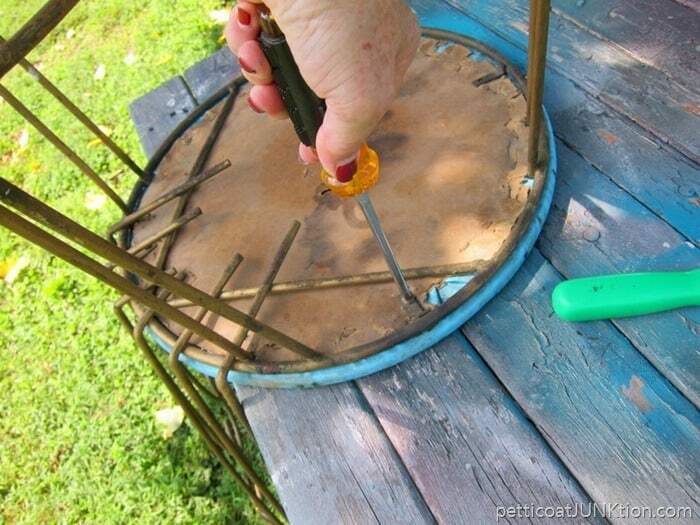 I filled that hole with wood putty and painted over the wood putty after it dried. I made a new hole a little lower on the drawer for the new red rose pull. There’s always something. NO project goes as planned. Moving on to the vanity chair which is a purchase from the Nashville Flea Market. I turned the chair upside down and removed the seat. 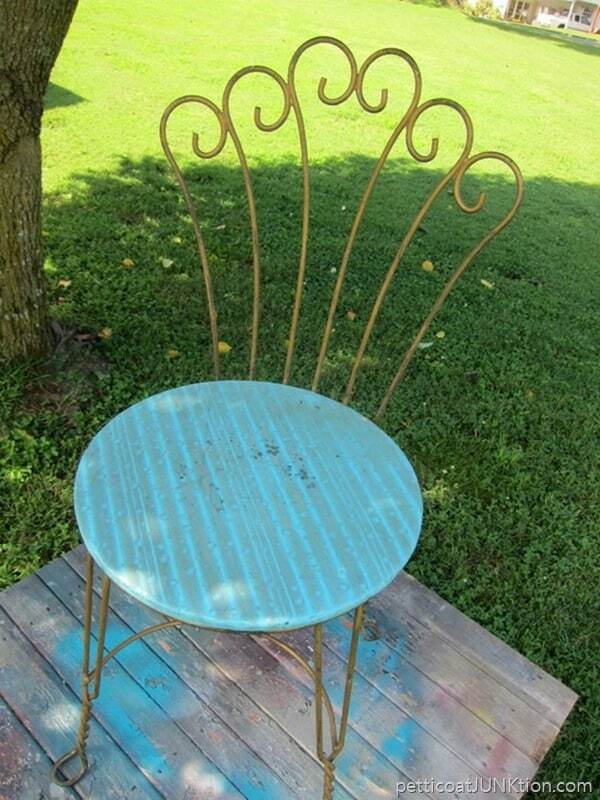 Then I painted it using RustOleum Metallic Oil Rubbed Bronze. Five minutes and the job was done. The fabric is from an old shirt. I love this shirt. I wore it for three or four years then something happened. It was a combination of shirt shrinkage after so many washings and dryings and weight gain on my part. Just the facts. 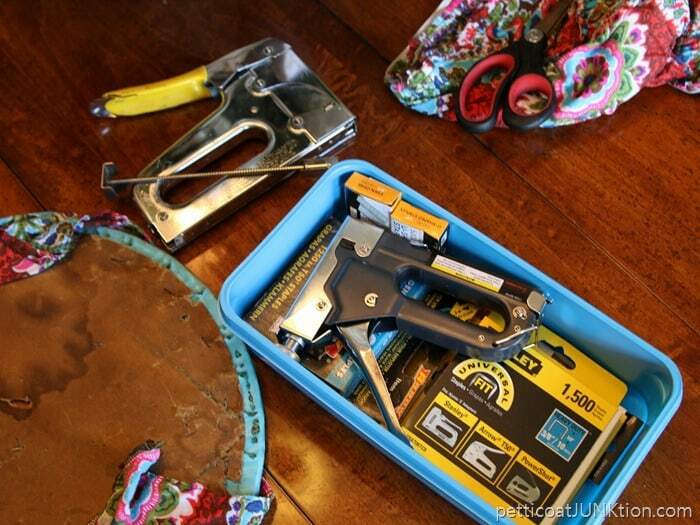 But, I kept the shirt and put it in my fabric stash in the workshop. Glad I did. I cut the bottom half of the shirt and it was barely big enough to cover the seat. It’s a good thing the fabric was stretchy. I stretched the fabric all around the seat and put a ton of staples around the sides. 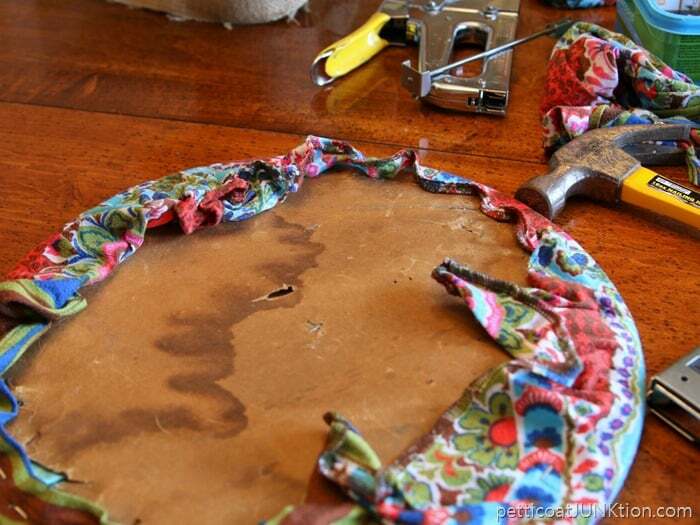 Only thing left to do was trim off the excess fabric and put the seat back on the chair. I like the Botanical paint. I wasn’t sure about it at first. The paint is really thin and I was afraid it wouldn’t cover well but it did. The paint takes a little longer to dry than any of the paints I normally use. I like the sheen on the finished project too. 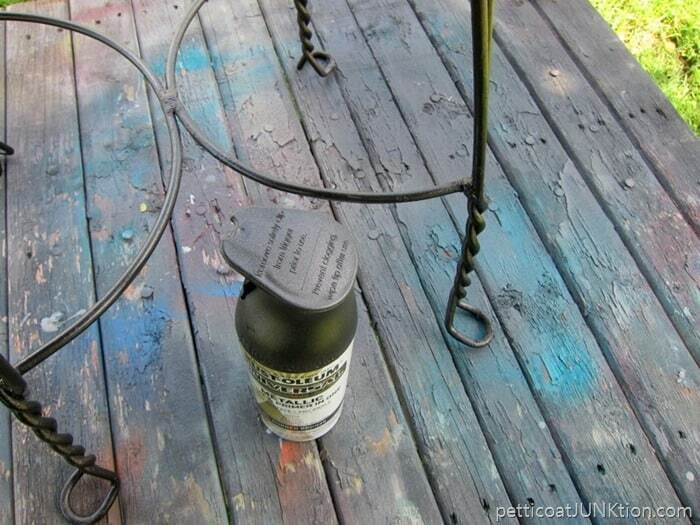 The paint contains a sealer so no need for wax or additional sealer. And that’s it folks. The project sounds like a lot of work but it really wasn’t. It’s actually two projects…..desk…and chair. 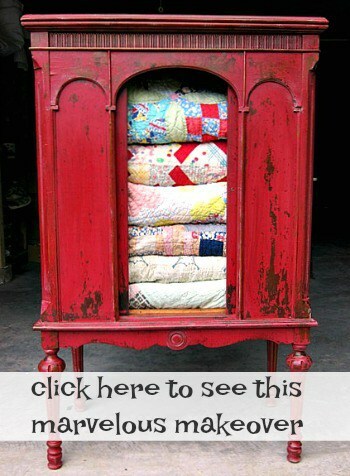 Shop thrift stores/flea markets/auctions for furniture! A shirt? Really!! 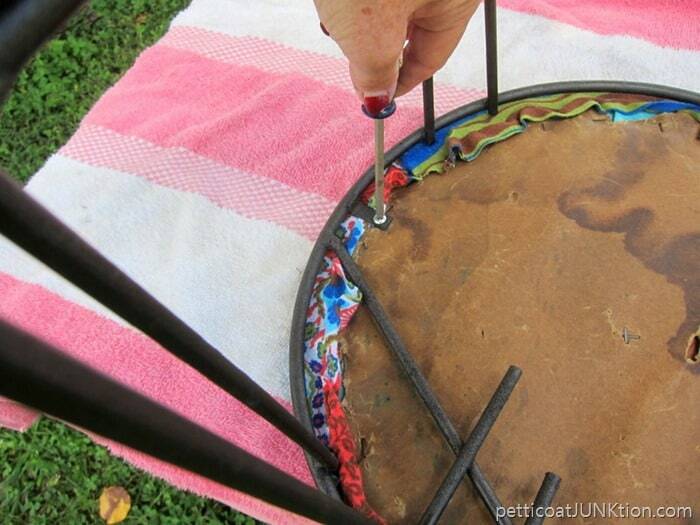 Smart move saving it because it makes for a gorgeous upholstered seat. I’ll be rethinking donating my old clothing after seeing this. LOVE!!! Nice job! 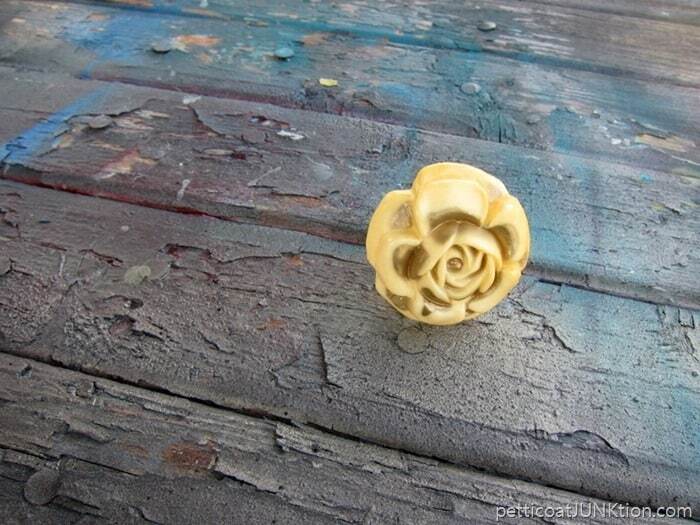 I really like the rose drawer pull. 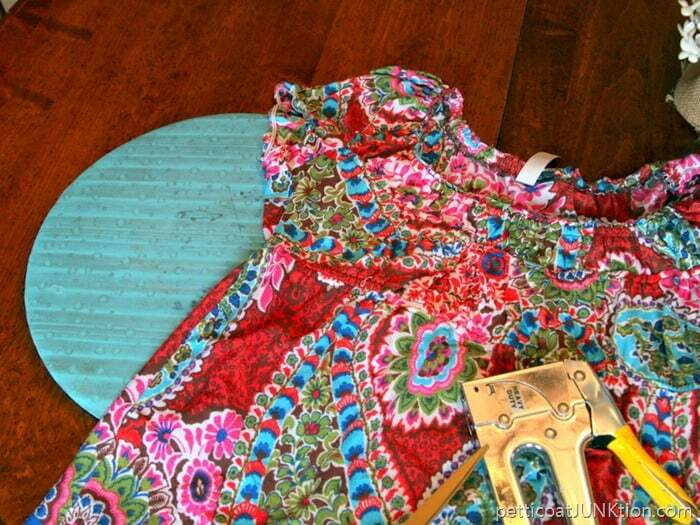 The blue of the desk and the bright fabric on the chair really complement each other. An appealing combination. 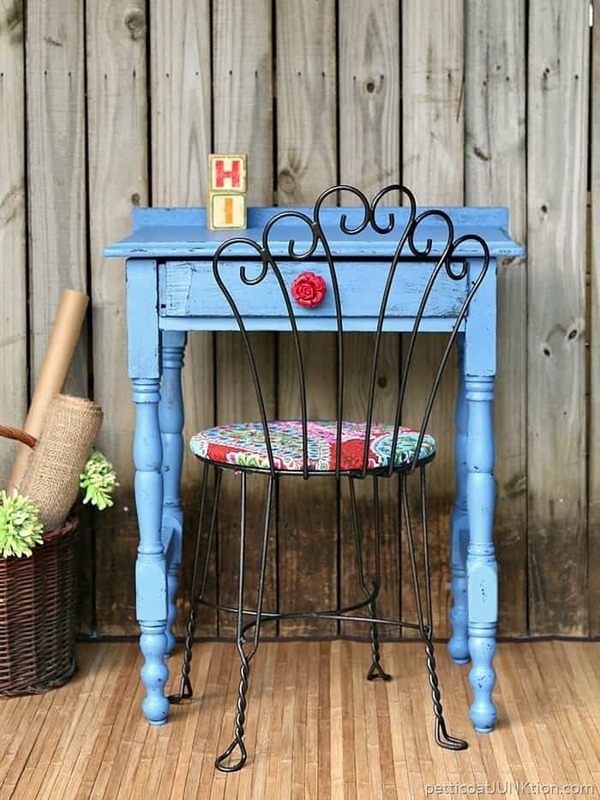 As always very cute…I have a desk similar to this one that I purchased on the Hwy 80 garage sale (Texas side). The problem with my desk is it was painted very poorly and had a lot of drips and paint runs. Any suggestions other than a lot of sanding? I never would have thought to use old clothing! Great move. I’m about to paint laminate shelves…..using primer, then paint. I see you mentioned sealer and or wax to finish. is this a necessary step, and can I skip it? Thanks for all you ideas and inspiration! !